1. Floor Plan Updates: We have been hard at work with our architect updating designs that will not only meet your needs, but the needs of your family and friends as well. We are excited to show you these updates! 2. Vision Casting: Come and hear a word from Pastor Gary carefully constructed with you in mind. God has great things in store not just for us as a church body, but for you, your family, your children, and your friends personally. So come, hear, and get inspired! 3. Special Thanksgiving Offering: So many of you have given so sacrificially throughout this past year and have exceeded the expectations of our capital campaign company, but there is still more to be done. Let's come together financially on November 18th and really give our campaign a boost so we can get in our new home as fast as possible and start serving the needs of the community. Start praying now and ask the Lord what He will have you do. 4. Site Plan Reveal: We have carefully crafted not only the inside of our new home, but the outside as well! We kept you as well as the surrounding community in mind to create an inviting atmosphere with incredible benefits for all. We are going to be a blessing to this community and on November 18th you're going to see why. And there will be so much more!! 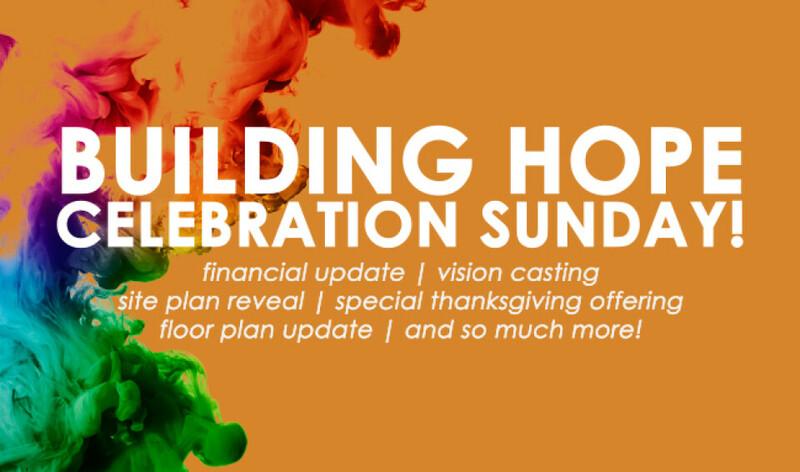 So bring your family and friends to come celebrate with us all that God is doing here at FCC and all that He has in store for you!